UPDATE 18-Oct-11: Updated Radio Transmissions rumour. This page consists of in-game rumours for the current Tempora Mutantur campaign. I will try to keep a ‘live’ compilation, updating it when called for. 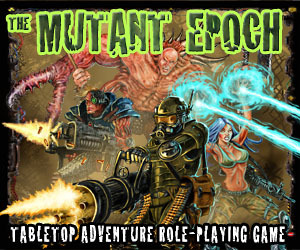 Also check out the Player Characters, Campaign Map, and Tau Storeroom pages. Mysterious radio signals of have been recently been detected by Tau’s technical staff, emanating in bursts from the vicinity of Ember (north of Tau). The transmissions are encrypted and have thus far eluded all attempts to unveil their contents. Furthermore, the bursts do not last long enough to pin down their exact location. A previous Surface Expedition Team has patrolled the wastes near Ember, using sensitive radio receivers to triangulate and determine the specific location of the transmissions. A colony of cybernetic/robotic humanoids has been determined to be responsible. Further intelligence on these beings is a high priority for the Elder Council of Tau. Beware – the ruins of Ember are dangerously contaminated by Creep. Radio receivers will be supplied free of charge, but protection from Creep will need to be procured independently by the Surface Expedition Team. 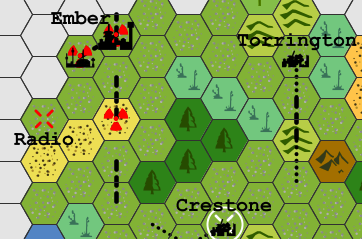 Relics of the Last War before the Fall, OGREs are massive self-aware robotic battle tanks. Armed with a wide range of weaponry and protected by metres of biphase carbide armour, they were juggernauts in combat. It is commonly believed that the OGREs were possessed by evil demons and initiated the Fall. A recent Surface Expedition Team has located the remains of an OGRE. Located south of the Eden Prairie Vault Complex, it appears to be immobilized due to battle damage, but at least some of its weapons are still active. It can be spoken with via a communicator, but its transmission range appears to be very limited. An enterprising Scavenger has established a way-station for Expeditions between Crestone and the Eden Prairie Vault Complex. Known as ‘Fort Bart’, this site provides protection from Rad Storms and mutant beasts to Surface Expedition Teams. The Elder Council of Tau has decreed that a permanent sentry will be stationed at Fort Bart (at least until exploration of Eden Prairie is complete). A recent Surface Expedition Team took cover from a fierce rad storm in what turned out to be an Ancient missile silo. In the control room of the complex, the party uncovered a regional map depicting the location of several other silos. Expedition Control will provide the location of the nearest unexplored silo, estimated to lie approximately a week’s travel by foot from Tau, to any team expressing interest in exploring the site. Tau Expedition Control has provided a potential lead for new Scavenger parties to pursue. A previous Surface Expedition Team found a sealed vault several days journey east of Tau. Although they were unable to penetrate its steel blast doors, they noted the words “EDEN PRAIRIE SHELTER PROGRAM” embossed upon its surface. Subsequent research by our Elders into our pre-Fall archives uncovered evidence that the Eden Prairie Shelter Program consisted of multiple interconnected vaults, each individually smaller than Tau – but altogether just as large! You are asked to return to the site and investigate – specifically searching for additional entrances which may provide access underground. Report back on the vault status and make peaceful contact if there are any human inhabitants remaining inside. Beware – dangerous droids have been encountered within! But previous reports also mention a mysterious ancient human hibernating in a regeneration pod. Safe recovery of this individual will be richly rewarded – he may be a sleeper from before the Fall. In the Crestone underground base, scavengers recovered “Jomat’s Journal”. It was written by a member of a previous year’s Surface Expedition Team. The initial entries are neat and organized, while the later ones are messy and scrawled.